It’s a bit odd to see this dish in Chinese take-away and fast food here in New Zealand but yes they do serve this alongside different Asian dishes like Sweet and Sour Pork, Black Pepper Beef and Fried Noodles. I am pretty sure this is not Chinese in origin as I haven’t seen this served when I used to live in Hong Kong, I never even encountered it in Chinese restaurants outside of New Zealand but regardless of its origin I just wanted to share this simple recipe. 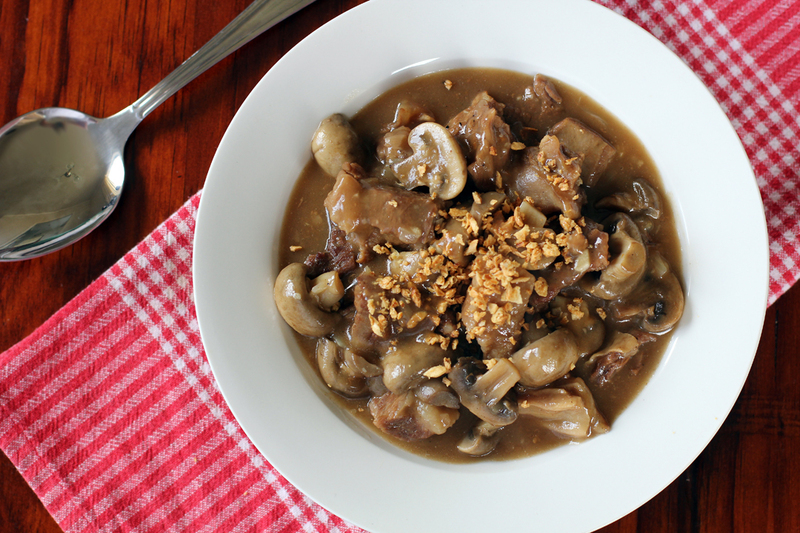 All you need is beef, mushroom and if you have some readily available gravy then you’re good to go. Place flour in a plate then dredge beef pieces until it’s lightly covered. Melt butter in a heavy pan then brown beef on all sides. Remove beef from pan then set aside. Add enough water until it barely covers the beef. Add mushrooms and simmer in high heat for additional 15 minutes. Pour gravy, salt and pepper and simmer for 15 minutes.